It was developed in conjunction with NHK Integrated Technology Inc. 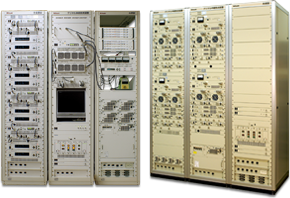 This is a relay transmitter of ISDB-T Digital Terrestrial Broadcasting that depends on "Transmission equipment common specifications for the Digital terrestrial Broadcasting" (Orange Book). This corresponds to all systems from "Broadcasting wave relay method" to "TTL receive method". 本システムは、ISDB-T 地上デジタル放送に対応した極微小電力中継局（ミニサテ）送信機です。MCPAにより最大8メディアの送信が可能です。 This system is a minimal low signal power transmitter for the relay of ISDB-T Digital Terrestrial Broadcasting. また、一体型基本装置は必要に応じて補償機能を内蔵することが可能です。 As the need arises, it's possible to have the compensation function built-in for integrate-type basic equipment. その他、放送システムを支援する様々な機器をラインナップしております。 We also developed Broadcast Related Equipments. この掲載内容は、予告なく変更することがあります。ご了承下さい。 The content of this publishing might change without a previous notice. Please acknowledge it.